First off - a reminder that we have a meeting on Wednesday June 26 at Pink Castle Fabrics. Bring your wrapped patchwork or applique, quilted and lined zipper pouch to join the fun! Bring your Round Robin quilt if you plan on participating. Bring your quilts to donate to Oklahoma if you'd like. 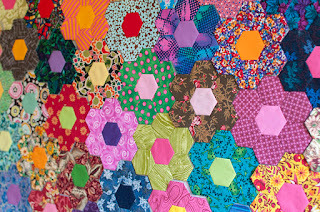 Lynn found a new project to peck away at - hexagon flowers! So bright and fabulous. And I released a toddler version of my Jorna pattern! Happy Summering and I hope to see you Wednesday night! 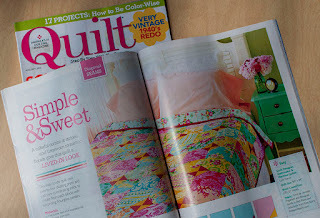 I am so happy to have a quilt to include in the weekly round-up this time! 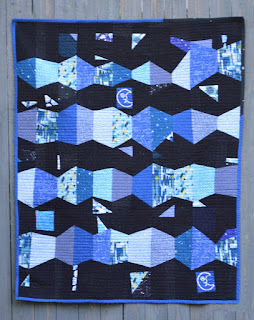 It's a baby quilt called "Trapezoids in Space"
Pam has some great posts showcasing the fabric offerings of Raleigh, NC! Looks like a great trip! 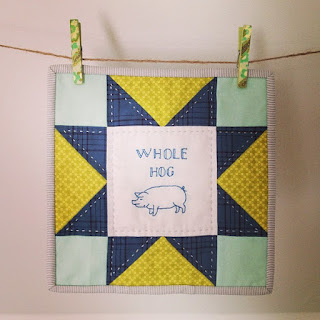 I love Lynn's post about projects she's made using fabric from our guild's swappy-grab. Have a friend who is interested in learning about quilting? 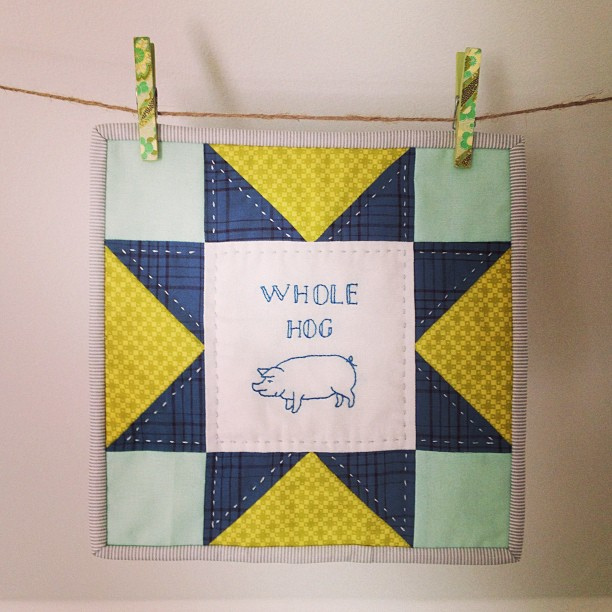 Check out Rossie's "5 Quick Facts About Quilting"
Check out this DARLING mini-quilt Dorie made. She's going all-in on getting stuff done! Ronit offers a tutorial on making a chuppah - like the beautiful one she made for her friends' wedding! I've added two pages to the top of the blog. "Round Robin Guidelines" explains our Round Robin process and the rules of the game. The "Swaps Schedule" will direct you to a Google Doc where you can see what we're making and when. Participate as you like! There will be a sew-in tomorrow at Pink Castle Fabrics from 12-4pm. This location is very close to MarkerWorks. First of all, thanks to Debbie for covering my secretary duties at our last meeting and writing the minutes. You can read them here! And here is an article about the "To Boston With Love" pennant display in Boston. There's a slideshow and it is so touching to see all of the flags! Wow. Speaking of Debbie, she's released an awesome applique pattern called "Chain Link" and it's awesome! I am in the middle of quilting a new project, but in the meantime I made a version of my Jorna jumper out of stretch lace. 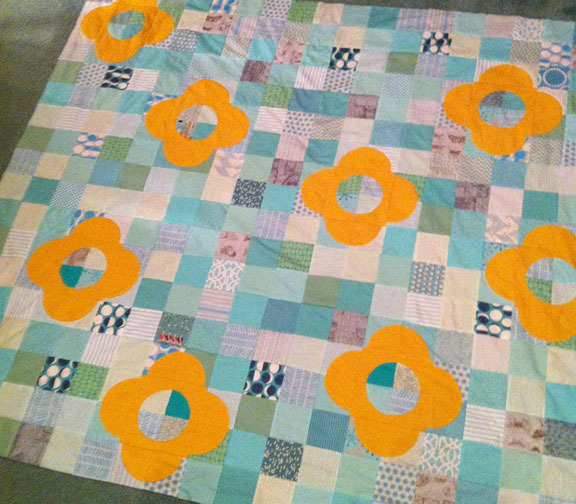 Amy is working on this beautiful drunkard’s path flower quilt. I was lucky enough to see this in person and the colors are stunning. 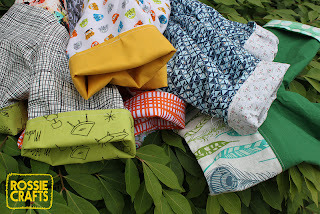 Rossie has been making ADORABLE baby pants using a pattern from Handmade Beginnings by Anna Maria Horner. Love them, and such a great use of fabric. One of Lynn's quilts, Curry and Cerise, is now Simple & Sweet in the latest Quilt Magazine (Aug/Sept 2013)! Congrats, Lynn! Love that. Lynn also made her beautiful daughter another Geranium dress that is super lovely. You all rock! Have a great weekend! Ginia reported that 17 people are confirmed for our retreat at the end of June, including 4 from other guilds. There is still time to sign up if you haven't done so, but please contact Ginia as soon as possible as she will be out of town for the two weeks before the retreat. She will be sending out info about Thursday night and food. If you have an extension cord, it might be helpful to bring it with you. Our library is officially installed at Pink Castle Fabrics and accepting book donations. 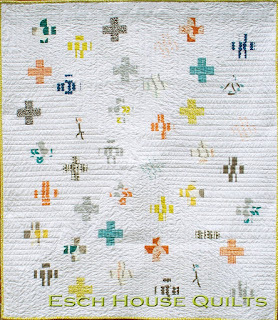 Despite the loss of our contact at Spoonflower, we are proceeding with the plan to auction the quilts to benefit Habitat for Humanity. Debbie will help Rossie take some good pictures for the auction. About 20 beautiful Blocks for Boston were collected and Brenda will send them off to Natalie in Boston tomorrow. Kathy generously agreed to quilt our Jay McCarroll Habitat quilts. The Oklahoma City MQG is accepting completed quilts for tornado victims. Please bring any quilt you'd like to donate to the June meeting as the deadline is June 30. If you are interested in attending the MQG Sew Down in Philadelphia, please let Jen or Brenda know right away. Those whose guilds are members of the national MQG can get a discount, but Jen needs to do some paperwork first. Jacquie Gering will be teaching in Michigan three times in the next few months! First at Camp Stitchalot from August 9-11. Then she'll be at the AQS show in Grand Rapids from August 14 - 17. 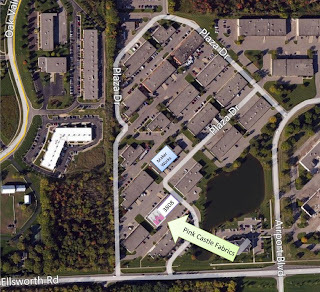 On October 11 and 12, Jacquie will be teaching for the Great Lakes Heritage Quilters in Bloomfield Hills (FYI, classes there are a fair bit cheaper than AQS). 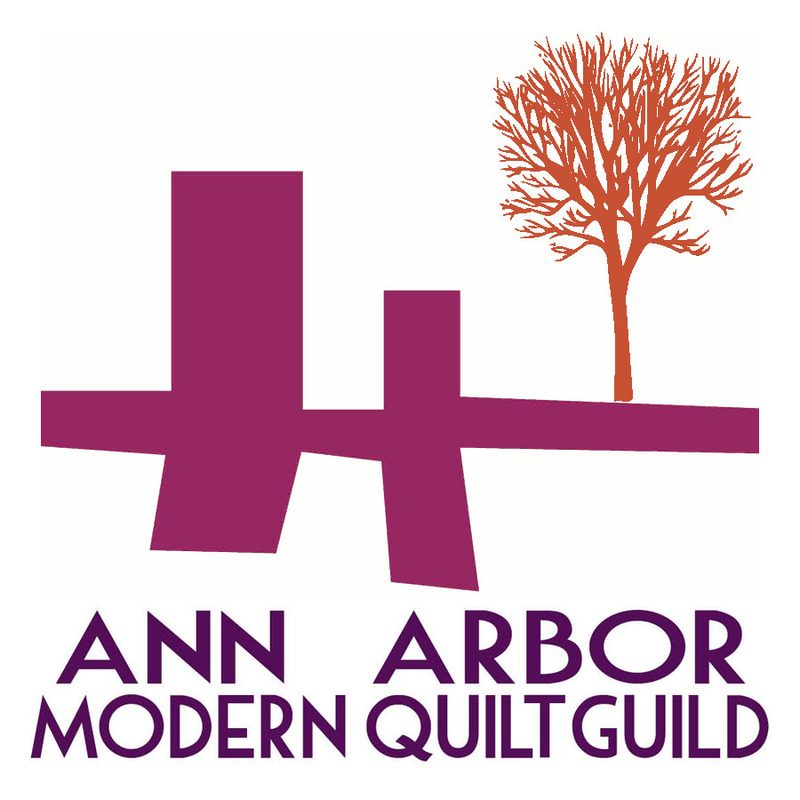 Debbie will be teaching her Bias Applique class for Quilting Unlimited by the Greater Ann Arbor Quilt Guild. Mary Hogan will be teaching three classes at QU - check them out here, here and here. Debbie made a chart that showed the old and new MQG definitions of modern quilting. The definition has changed somewhat as modern quilting has evolved. It was suggested that pictures of quilts demonstrating some of the main points would be helpful. Index cards were passed out to take suggestions for future program activities. 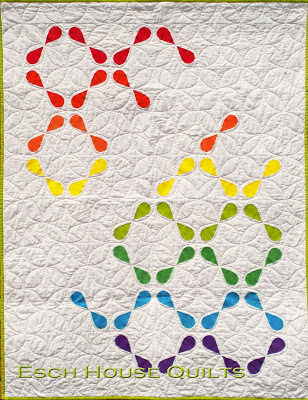 The fantastic Round Robin quilts were reviewed. Anyone can jump in at any time - contact Dorie if you'd like to participate. Jenna Brand is the winner of the Madrona Road challenge! Congratulations, Jenna! Rossie announced that the Grand Rapids Art Museum has an exhibit of Susana Hunter's improv quilts from now through August 25. Debbie is organizing a day trip to the AQS show in Grand Rapids on August 15 or 16. If you are interested in going, please contact her. Next month's activity is a zippered pouch swap! 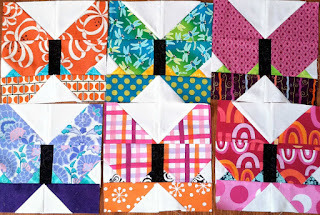 Bring your wrapped patchwork or applique, quilted and lined zipper pouch to join the fun! Brenda announced that Pink Castle Fabrics will now officially be open M-F, 9-5 and Sat 11-2. Woo hoo!